Make a Difference by Volunteering with TLC. Volunteers help plant native flowers and trees, build trails, monitor preserves, and more. You can make a difference by using your time and skills to support TLC’s conservation work. There are numerous opportunities below and on our events page to help TLC save the places we love here in the Triangle. Please contact Deja Smith at dsmith@triangleland.org for more information about these and other volunteer opportunities. Thanks! Please visit our VolunteerHub site and create a volunteer profile to see and sign up for our upcoming opportunities. Volunteers assist with stewardship of TLC properties by providing many types of physical support in the field. Their projects are varied and interesting and include building kiosks, removing invasive plant species, building and maintaining trails and cleaning up streams. Check our VolunteerHub page for upcoming Trail Crew dates and mark your interest. Throughout the year we organize groups of volunteers for outdoor service days that last anywhere from 2- 6 hours. If you are actively involved in a group that would be interested in a service day we can help you arrange one on a TLC property. Please review our Corporate Engagement Policy and email Deja Smith dsmith@triangleland.org with the size, interests, and location of your group if you would like to customize a workday. For planning purposes we request at least a month’s notice. 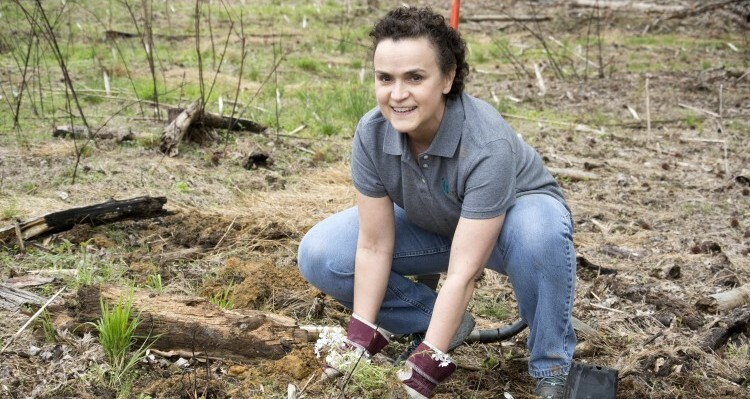 Volunteers preserve and improve the physical and biological components of TLC’s Nature Preserves, particularly those in the Western part of the Triangle. The Conservation Corps meets weekly on Thursdays from 9-12 to carry out trail construction and maintenance, invasive species monitoring and control, basic construction and woodworking projects, general landscaping, property and equipment maintenance, and garden construction and management. Visit our VolunteerHub page and mark that you’re interested in Conservation Corps to receive weekly email updates about projects. Similar to our “Conservation Corps” program, but will specifically be at Walnut Hill (near Clayton) and only meet on one Wednesday per month. This group will help with invasive removal, fencing repair, property cleanup, and trail building when that portion of the project gets underway potentially next year. See all the upcoming Walnut Wednesdays on our VolunteerHub page. Site Stewards assist in the stewardship of TLC properties by walking the trails and boundaries of our preserves, doing light maintenance during these walks, and reporting on conditions to the TLC’s Stewardship staff. This position is for the sociable outdoor enthusiast. The bulk of this position will be planning and leading informal hikes on our preserves. As time permits, you may also be involved in outreach planning and formal outreach events. Please fill out our volunteer form with the details of your interest, availability, and experience. We can always use an extra pair of hands in our office. Join the hubbub by assisting staff with office-based projects include stuffing envelopes, pulling together new member packets, preparing for events and other miscellaneous projects. Please fill out our volunteer form to learn about office projects as they arise or to set up a regular office schedule, almost all office tasks take place M-F 9-5. Environmental Education Volunteers assist with programs and educational outreach events and help create educational materials for programs. TLC can provide training to volunteers who would like to assist with programs, working with individual children one-on-one, helping to hand out and collect supplies, and providing extra support for children that need more adult help. If you already have experience teaching or working with children, TLC volunteers can also help run group activities or lead guided hikes. Volunteers must be willing to submit to a background check. Email our AmeriCorps member at americorps@triangleland.org for more information and upcoming opportunities. Community Engagement Volunteers connect our community with all of our benefit areas which encourage the appreciation of TLC wildlife habitats, local farms and food, clean water protection, and connecting people to nature. Opportunities include ongoing and one-time tasks such as assisting with TLC events, presenting to community groups, and tabling at farmer’s markets and other events throughout our six county region. If interested please fill out our volunteer form. The Friends of the Forest Program is an independent group volunteer option perfect for Scouts, youth groups, and outdoor service organizations who want to volunteer at their convenience. By helping collect litter at TLC’s nature preserves you keep the area healthy for plants and animals and pristine looking for people exploring nature. The Friends of the Forest kit includes gloves, bags, maps, safety instructions, and several environmental education activities and games to complement your volunteer service. Email our AmeriCorps member at americorps@triangleland.org for more information about the Friends of the Forest Program and to schedule a service date.